FLYWHEEL USED: STOCK CHEVY 168 TOOTH FLYWHEEL WITH 10 1/2" OR 11" PATTERN. MATERIAL / MACHINING METHODS: WILCAP CNC MACHINED CAST ALUMINUM BELLHOUSING, ALLOY DOWEL PINS, ENGINE AND FASTENERS. WILCAP STEEL SLEEVED OILITE PILOT BEARING ADAPTER. ADDITIONAL PARTS NEEDED: ENGINE, TRANSMISSION, STOCK ENGINE 168T FLYWHEEL, STARTER, & CLUTCH COVER/DISK. FORD THROW OUT BEARING, CARRIER,FORK, CROSS SHAFT. 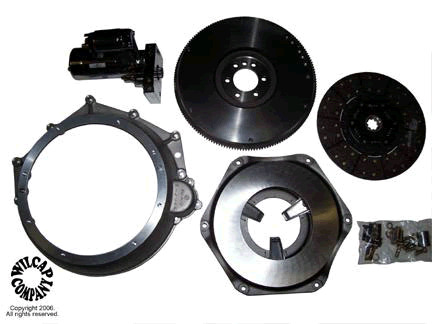 We can supply the flywheel, starter, proper clutch cover, disk, throw out bearing, carrier, fork and cross shaft. We have the clutch cover and disk made for us specifically for this application. 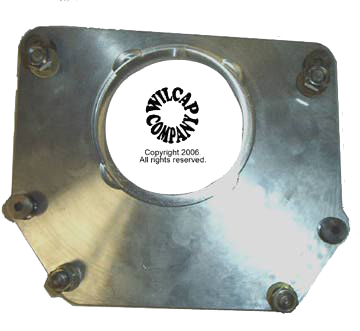 Wilcap can also supply a new flywheel for your project or recondition your stock flywheel. Complete instructions are included. Muncie Bolt Pattern to Ford V8 T5 1986 to 92 transmission. Includes fasteners and pilot bearing adapter. Muncie Bolt Pattern to 1955-1964 Ford transmission. Includes fasteners and pilot bearing adapter.